When Ron and Ray Atkinson decided to research their family history, they little expected to discover that their great-uncle had the kudos of being one of the greatest British violin-makers. William Thomas Reed Atkinson, whose story began in Tottenham, North London and ended in Paglesham, Essex, has a whole chapter to himself in the "Violin Family and its Makers in the British Isles". He was born in Stepney, east London, in 1851 and attended school until he was 14, at which point he was packed off to Birkenhead to work in his uncle's pub. He did not last long there, and soon joined the Merchant Navy and served as a 2nd steward on steamships working out of Liverpool. By 1869, he was back in London with his parents and had become apprenticed as a carpenter and joiner. He worked for a Tottenham builder, Arthur Porter (his future brother-in-law) and amongst other things helped construct the original wooden grand-stand at White Hart Lane. 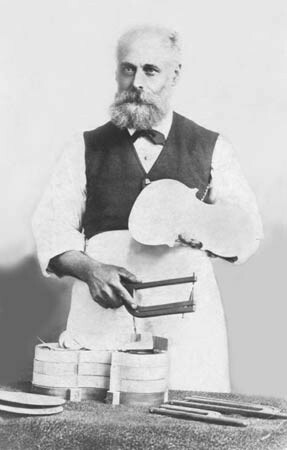 Atkinson suffered a serious injury during his time as a carpenter which led to him having a leg amputated below the knee and having to wear a wooden prosthesis. Perhaps as a result of this accident, Atkinson began to concentrate on cabinet-making. He took a great interest in wood finishes and varnishes, and experimented with his own compounds. 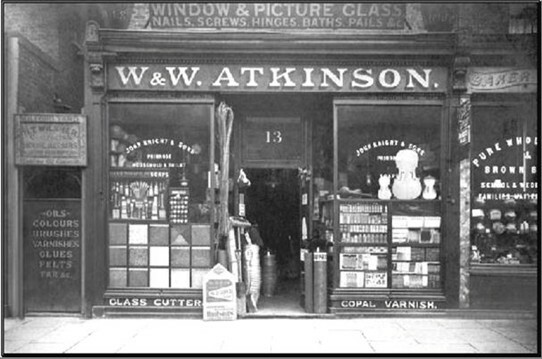 When he took on a double-fronted shop with a rear workshop in Church Road, Tottenham in the 1880s, violin-making became the focus of his activities. Varnishes play a critical role in violin making. The cellular structure of wood makes the raw instrument very unstable and highly susceptible to changes in temperature and humidity. It is the multiple layers of varnish and the manner in which they are applied that transforms this into a quality instrument able to hold its tune and tone. All the famous violin makers, including the masters from the Cremona region of Italy, had their own methods and secret formulations for varnish. It seems that William Atkinson was no exception. Interviewed for a newspaper in 1928 Atkinson is quoted as saying, “If I were asked what was my greatest gift, I should say it was to make a violin, but I would not spend five minutes on it if I had not got the varnish I use." "That varnish is my own, and I would stake my life that it is the same as that which the old masters used." The oil-based varnish Atkinson used took a long time to dry. He said he could make a violin in a fortnight, but he would need two years in which to varnish and dry it. It was the varnishing process that eventually forced Atkinson to leave Tottenham. In those days, the varnish had to be air dried and in the early 1900s the air in Tottenham was becoming increasingly sooty which was spoiling the high quality finish for which Atkinson was striving. In 1911 he moved to the village of Paglesham in Essex where he took over the village general stores and Post Office at Church End. The idea was for his wife to run the Post Office and general store; they could live in the accommodation over the shop whilst on the third floor there was a workshop where he could devote his time to violin-making. To assist in the process of drying the varnish on violins, he rigged up a “washing line” and pulley system out of the third floor workshop window to a tall post in the garden. On this line he would hang violins to dry and winch them in and out through the window as the weather conditions required. An elderly couple, who had lived in Paglesham all their lives, remembered seeing the violins hanging out to dry on this “washing line” device as they went to school. "The old man realised too late that he was dying, and tried to impart the secret to his son, but the effort was too much for him. He fell back on his pillow, dead….he was an old sailor, and lived for many years at Tottenham, moving to Paglesham in order to secure the pure air and sunshine for drying the varnish on his violins. To fill in his time he took a small general store and became postmaster for the village”. 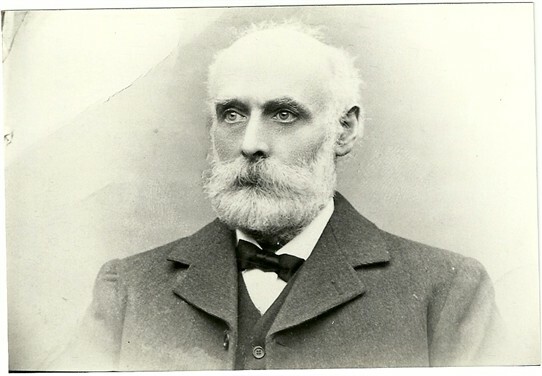 William Atkinson died aged 78. He was acknowledged as one of England's finest violin makers and took the recipe of his renowned violin varnish to the grave. 1. Vignette of William Atkinson by Professor B. W. Harvey, Faculty of Law, University of Birmingham. The article is a PDF document. Wait a few seconds for it to load, then use your browser back button when you have finished looking at it. Click here for the pdf article. 2. A French luthier shown making parts of a cello mixed in with clips of it being played. The last of the three images on the opening page is a video. Click on the image arrows until you find the video, then click on its start button in the bottom left corner of the video frame. Click here for the luthier website. 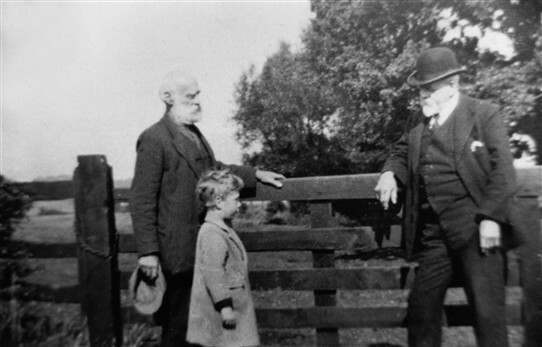 Wm Atkinson (left), Ben Atkinson (grandson), Rev. 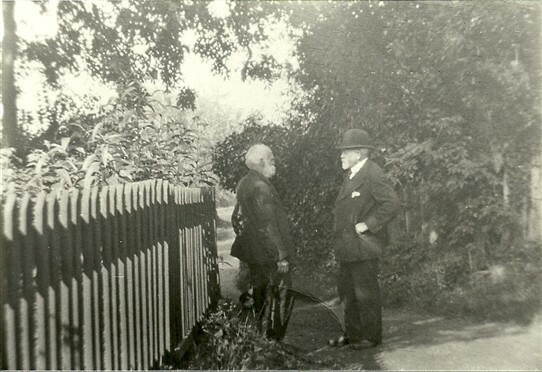 Jennings (right). Photo was taken in 1926 at "Sweetups" Church End. This page was added by Helen Barnard on 25/01/2012. I have a violin with a label William Atkinson Tottenham 1900 and have been trying to research Wm Atkinson. These stories are very interesting - he must have been a very intesting man - thanks for posting them. I am not sure if my violin is the real thing but certainly has great sound and is very well made. If I ever find more information I will certainly post it. Hi Andrew and Andy, I was hoping that you could let me know where my great great grandparents are buried in London ie which cemetary as I would like to make a visit. I have a couple of black and white photographs of Ben my grandad that you might be interested in and also some of my uncle Douglas as you can clearly see the resemblance to William-it's quite uncanny. My email is debdotspider@hotmail.com. Thanks so much. Love Deborah. Hello - it was nice to see a photo of my relatives - I have been researching myself for a while. Ben, the boy in the photo, I believe to be my grandfather. He married my nan, Doris Elmore, and they had 4 children - Douglas (my uncle) also uncle Steven, auntie Kath and my mother Linda. I visited the church in Pagglesham and also saw the building that used to be the post office. Please contact me if you have any other photos you would be willing to share. Love Deborah. I am a keen amateur violinist. I had never heard of William Atkinson until earlier today, when I played one of his instruments from 1892 - it was a stunner I must say. Very interesting story. I am Ben Atkinson's eldest daughter and I was very interested to see this. I have a 1904 Atkinson violin that I play regularly. It is a fine instrument. I assume that most of his output is still being played. It is not often that quality violins lie unused for long. Hi Ron, my Mum is well and living in Long Melford in Suffolk, she is 83. As for my grand father, John, he had five sons, Ben,Bob, Don, Eric and Alan my father, all born in Paglesham. unfortunately all have passed on now, Eric being the last aged 83. Thank you Sue and Andy for your comments and your interest in this article. Regarding your first question, Sue, I can tell you that William Atkinson is not buried in Paglesham. He and his wife, Mary, are buried in the churchyard in Tottenham N17 where William started his violin making career and had his first shop. William and his wife did have 3 children, but I don't think any would have attended school in Pagglsham since they did not move there until 1911. Their first son (John) was born in 1882 but sadly died as an infant in 1888. A second son (also William) was born in 1883 and a third son (also John) in 1888. Since children left school at age 14 in those days I doubt that any attended school in Pagglesham. I cannot give a definate answer as to whether any of his violins are still being played today but I think it very likely. About 300 are thought to have survived and they are now much sought after. One sold at auction in 2006 for £8,500. I assume that this one must have been in particularly good condition and very likely in playable condition. I can't imagine anyone paying this much for a viloin if they were not intending to play it. The Bruce Castle Museum in Tottenham have recently acquired one and although this is not currently playable, it is in good condition. I have seen it and judge that it would not take very much work to put it back into a playable condition. Although we have not met Andy, it is clear that we are related. I have however, had the pleasure of meeting your mother, Beryl, when my brother and I were doing our research on William Atkinson. It is lovely having this contact with you and your family. This gentleman would have been my great great grand father, my father was Alan, his father was John, who owned the post office in Pagelsham. When I was young we had all his violin tools and templates from the violins in our shed at home, and my mum had a violin he made until she sold it at Christie many years ago.